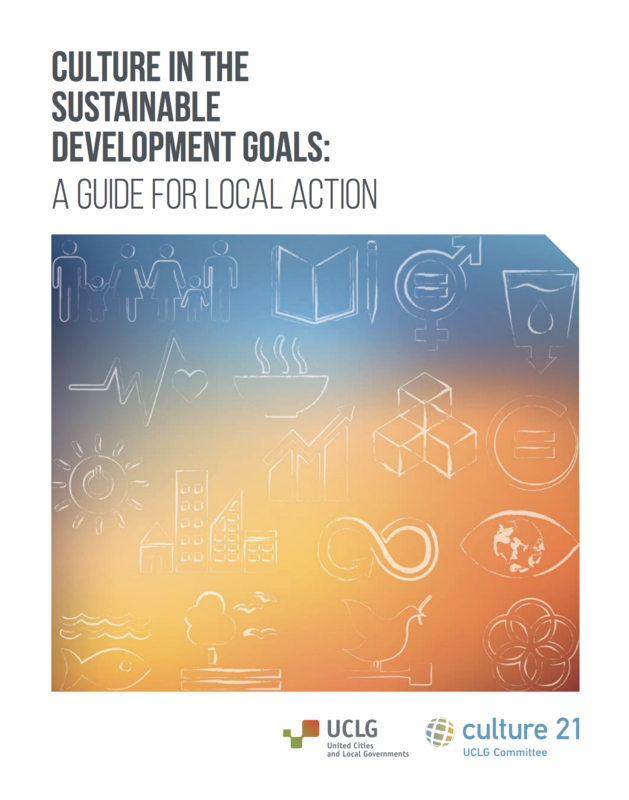 In the context of the advocacy work conducted since the adoption of the UN 2030 Agenda for Sustainable Development in 2015, and aiming at its full localisation and implementation at the local level, the Committee on Culture of UCLG has been working on a new document: "Culture in the Sustainable Development Goals: A Guide for Local Action". The publication "Culture in the Sustainable Development Goals: A Guide for Local Action" aims to provide practical guidance to local and regional governments, civil society organisations, private organisations, culture and development professionals, and other stakeholders interested in strengthening partnerships, policies, projects and practices around the place of culture in the achievement of the Sustainable Development Goals (SDGs). The document is structured on the basis of the 17 Sustainable Development Goals (SDGs) that make up Transforming Our World: the 2030 Agenda for Sustainable Development, adopted in 2015. Under each Goal, the document presents information that helps to understand why culture is relevant and how this connection can be made effective at local level, including in areas where connections may only be implicit, and offers several examples of cities or local governments which have implemented projects, programmes and policies that are directly related to the Goal area. These examples are part of a wider database of good practices called OBS which materializes through a global website on culture, cities and SDGs. “Culture in the Sustainable Development Goals: a Guide for Local Action” builds on the work of the UCLG Committee on Culture, as well as on the advocacy campaign #culture2015goal which has been run together with several partner international cultural organisations and networks, and on many relevant policies, programmes and projects implemented by cities around the world, and contributions made by several other organisations, networks, communities and individuals that have addressed and demonstrated the cultural dimension of sustainable development. The Committee on Culture invites all cities, local government, local stakeholders, cultural actors, academics and experts interested by the relation between cultural, sustainable local development and global agendas to read and share this unique publication. Read about "Culture in the SDGs" campaign. Visit the website of the Committee on Culture of UCLG.